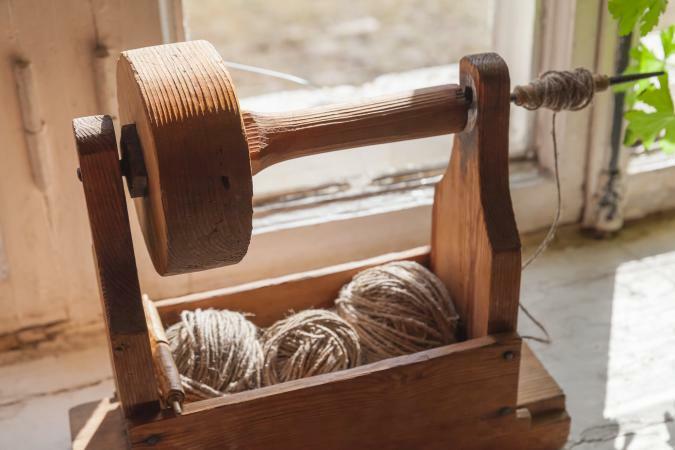 The machinery for spinning threads and yarns has evolved from hand spinning flax into linen using a spindle in Egypt as long ago as 4,500 B.C.E. to computer-controlled open-end spinning in 2000 C.E. The evolution of textile processing has been a major contributor to technical development in general. The Romans founded colleges, essentially the first agricultural experiment stations, at which enhancements of the methods for flax and wool production were developed and disseminated throughout their empire. Yarn spinning is needed to impart strength and continuity to collections of fibers, particularly if they are dis-continuous. Fibers as short as one inch (2.5 cm) can be formed into continuous yarns by twisting them around each other and, if the fibers have a natural twist, such as cotton, the limit can be as short as 3/8 inch (1 cm). By around 3,500 B.C.E. the Egyptians started using cotton as a fiber and a parallel development occurred in Peru around 3,000 B.C.E. Since the cotton fibers are round while growing but flatten and become ribbonlike when dry, the shorter fibers can be twisted into a yarn using a supported spindle. However, since cotton was difficult to spin prior to the development of more mechanized spinning techniques, it was not used extensively in Europe until the industrial revolution. An important early mechanical innovation for spinning was to attach a whorl, or flywheel, at the lower end of the spindle in order to facilitate rapid rotation, which resulted in an increase in the production rate. In India around 750 C.E. the Charkha, or Jersey Wheel, was developed by mounting the spindle on a frame, and rotated by connection to a wheel, with a treadle being added by the Chinese. Still, the spinning process was discontinuous because the drafting, that is drawing out of the fibers, and twisting were carried out in separate steps. Leonardo da Vinci contributed the flyer, which allows the twisting and winding to be carried out continuously and simultaneously, leading to development in the sixteenth century of an efficient way of spinning that was used for a long time. Subsequently the feeding and drafting of the fibers became the rate-limiting steps in the spinning process, until significant improvements occurred in the eighteenth century: John Wyatt introduced the concept of drafting rollers in 1733, being incorporated by Richard Arkwright into the Water Frame spinning machine. In 1770 James Hargreaves invented a spinning machine named the Spinning Jenny in which the stretching and twisting were mechanized. In 1779 Samuel Crompton combined the concepts of incorporating the drafting rollers, stretching, and twisting into an enhanced spinning machine-which he dubbed the Mule-but it was still a discontinuous process. Charles Danforth's throstle and John Thorpe's frame and traveler are the precursors of the modern continuous ring spinning machines, which revolutionized textile machinery. As a result the spinning speed was limited only by the maximum traveler speed, determined by heat generated due to friction in ring frame. Until the development of the break spinning, or open-end spinning, drafting and twisting took place concurrently. In open-end spinning, drafting, twisting, and winding are completely separated. The drafting stage ends up with the creation of a stream of individual or single fibers at a point on the spinning line where the air velocity is at its maximum. Subsequently, twisting begins in the "condensation stage," where the velocity is decreased enabling the assembly and twisting of multiple fibers to form yarns, of which fineness depends on the drafting ratio. The most important advantage of open-end spinning is its very high productivity, the package size depending on the winder and not on the spinning device, as is the case with ring spinning. There are many ways to perform open-end spinning, but rotor spinning seems to be one of the best airmechanical ways to enhance the technology. 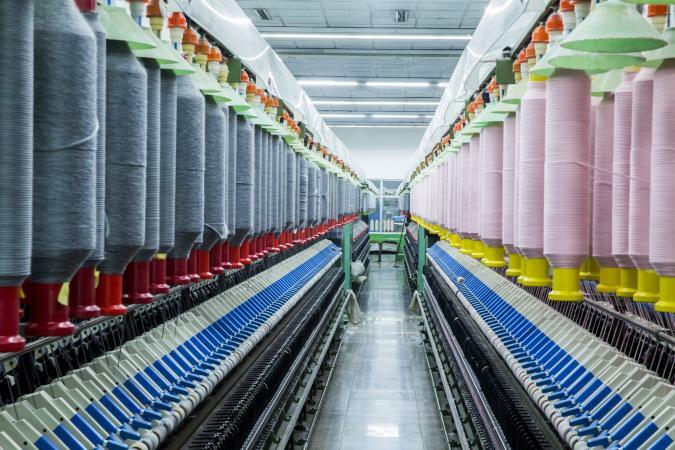 As of the early 2000s high performance rotor spinning units can run at speeds up to 150,000 revolutions per minute, delivering yarn are the rate of 235 meters per minute. They produce large packages of yarn in contrast to ring spinning bobbins that are limited by the size of the spindle. A critical aspect of yarn spinning from the early spindles to the modern ring spinning and open-end methods is imparting twist to the fibers making up the yarn to provide cohesion and strength. In all cases, that is imparted by taking up the yarn on a rotating device with the collection of fibers being fed either parallel to the long axis of the rotating device or at an angle less than 90 degrees to it. If the fibers were fed perpendicular to the axis of the rotating device, no twist would be imposed. This twisting is accomplished with a spindle by having the fibers fed almost parallel to the long axis of the spindle. For the early spinning wheel this was accomplished by feeding the fibers at an angle onto a mule (a rotating rod), so that they would move toward the opposite end of the take up. In ring spinning the traveler is a guide that spins around the take up guiding the lay down of the fibers (sometimes under computer control) and the traveler is fed nearly parallel to the long axis of the take up. In open-end spinning the fibers are deposited on the inside of a rotating drum after being fed into one end of the drum. Baines, Patricia. Spinning Wheels: Spinners and Spinning. New York: Charles Scribner's Sons, 1977. Benson, Anna P. Textile Machines. Aylesbury, U.K.: Shire Publications, 1983. Shire Album 103. Catling, Harold. The Spinning Mule. Newton Abbot, U.K.: David and Charles, 1970. Dyson, Eric, ed. Rotor Spinning: Technical and Economic Aspects. Stockport, U.K.: The Textile Trade Press, 1975. English, Walter. The Textile Industry. London: Longmans, 1969. Lord, P. R., ed. Spinning in the '70s. Watford, U.K.: Merrow Publishing Company, Ltd., 1970. Wilson, Kax. A History of Textiles. Boulder, Colo.: Westview Press, 1979.